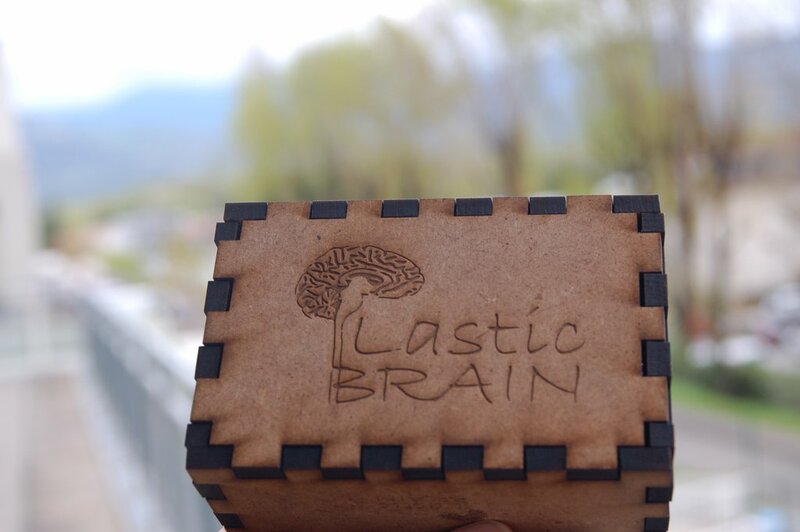 PlasticBrain project | PyVotons ! PlasticBrain is a display device using a 3D realistic model of the brain. It can display functional activity (fMRI, EEG, MEG, NIR, PET…) or any other information (connectivity, anatomical atlas), to visualize data, teach or for biofeedback-therapy. 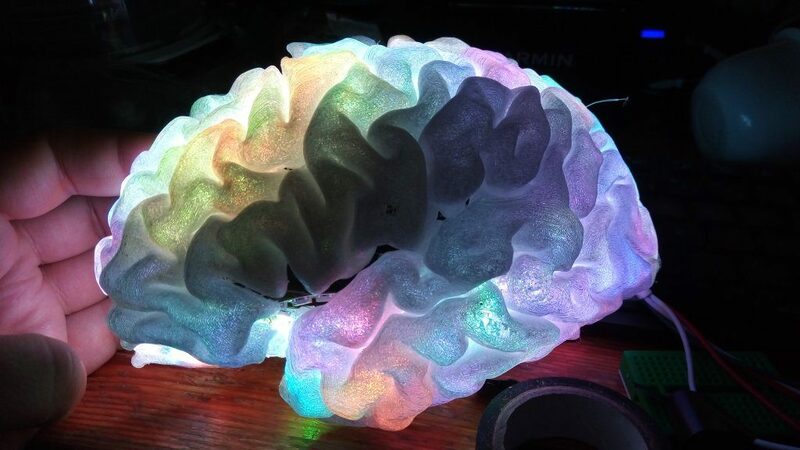 It is built from a 3D print of a human brain segmented from an MRI, some RGB LED strips and an Arduino UNO to drive the display. LEDs are either directly put inside the hemisphere or outside on a matrix (with the light being guided inside the model by optical fibers). It is distributed freely (software is distributed with the GNU GPLv3 license, and the harware design is distributed under the conditions of the CERN Open Hardware license). Acquisition of a 3D T1-weighted MRI with a resolution of around 1 mm isotropic. Optional : generate a mesh with tunnels where electrodes were implanted in a patient’s brain (SEEG or DBS electrodes) with IntrAnat software. Optional : Split hemispheres in two parts to be assembled after LED insertion : choose a cutting plane in Blender, use a Boolean modifier to cut the mesh, duplicate and do it again for the other side. Apply the modifiers.. Choose no fill-in for the print (to have room for the LEDs) and use support structures for overhanging issues. With a Ultimaker2 FDM printer and transparent PLA from Colorfabb : multiple print failureswith unexplained offsets of some layers during the 11 hours of printing, and one successful print. Use of individually adressable RGB LEDs (e.g. WS2812B) strips, as dense as possible (now 144 LEDs per meter). According to the scale of the model we need between two and three led strips per hemisphere. Warning LEDs can get relly hot, beware of overheating ! Roll the LED strip around inside the hemisphere and place the LEDs carefully on the surface facing outwards. Cover the surface as well as possible. Use the three cables from the LED strip to power and pilot it : plug to a 5V power supply that can provide enough current on the black and red cables (beware of getting the polarity right), plug the green cable to an output PIN from the Arduino. Between the power cables + and -, solder a capacitor to smooth the current peaks caused by the LEDs switching on and off, because it can prevent the color signal from the Arduino to work. Tie fibers together to match the shape of an SEEG electrode, with a fiber end where each electrode contact should be. 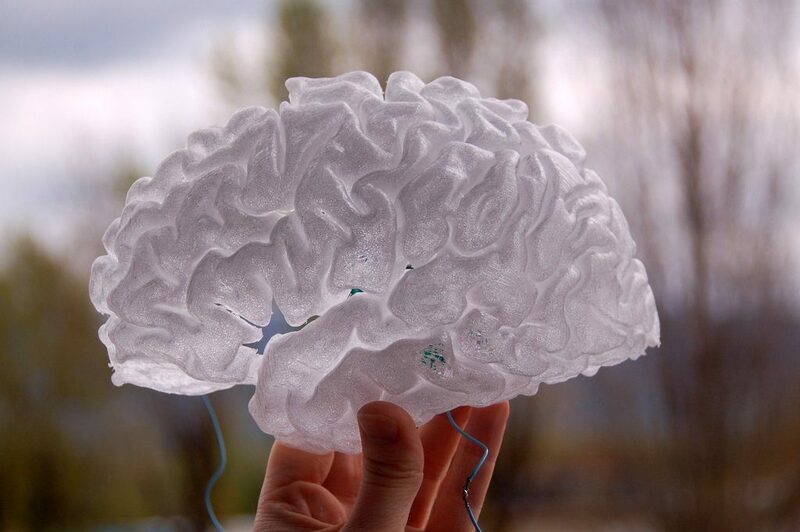 Place the fiber-optic mock electrodes in the tunnels printed for them in the brain model. Coupling with Bitalino to display heart actity or breathing as colors on the device. In 2014/2015 we bought an Arduino to synchronize a clinical SEEG recording system with a stimulation software. As we had this component available, we realized that because 3D printing and DIY electronics were now available to the general public, we could build an old idea of mine : display on a realistic 3D brain its activity, realtime or afterwards (for example to replay an epileptic seizure in slow-motion), or use it to display anatomical regions.